El Farol, located at 808 Canyon Road and the oldest bar in Santa Fe, NM, brings the Terry T Trio to the stage from 9 to 11 p.m., Thursday, Dec. 27, 2012. Santa Fe dining institution and reliable entertainment hotspot El Farol is the oldest bar in Santa Fe, NM. During 2012 El Farol has brought entertainment in virtually every single night of the week, much to the delight of both locals and visitors from out of town. 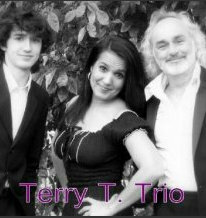 It has scheduled the Terry T Trio to come entertain El Farol patrons from 9-11 p.m. Thursday, Dec. 27, 2012. SantaFe.com, Santa Fe, NM’s premier on-line visitor guide, has this event listed on the company’s event calendar. The Terry T Trio is a combination of 3 very talented musicians: Terry T., Jeff, and Joshua Pinkham. Terry and Jeff have been based in Tampa and have been performing in the Tampa Bay area and for over 25 years. They've chosen to stay in Tampa to raise their 3 talented children, Savannah (24), Vanessa (22), and Joshua (19). Terry T. Pinkham is an award winning vocalist whose smooth, powerful voice covers nearly every musical style. She has recorded for and was signed with Polygram/Mercury Records. She has toured nationally and internationally as lead vocalist and sang backup with many famous recording artists, including Lou Gramm, of Foreigner (backup vocalist), Larry Hoppen of Orleans Terry has performed several live shows with Larry as well as recording a duet with him on his CD for children with HIV.